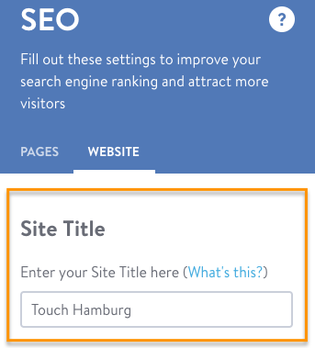 Using the SEO tools built into Jimdo, you can add your site to Google, set your Site Title, Page Titles, and Page Descriptions, prepare your Page URLs, and more. First things first: does your website already appear in Google’s search results? Use the Google Indexing tool by opening the Menu and navigating to SEO > Settings > SEO to see if it does. A small menu in a column format will then appear on the left side of your browser window. 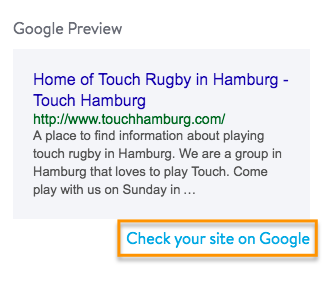 You can click on the ‘Home’ tab to see a preview of your website when appearing on Google’s search results, along with a link to ‘Check your Site on Google’. If so, great! If not, it’s a great idea to submit your URL to Google or, even better, claim ownership of your site with Google Search Console. Doesn't look right? We've recently updated this feature. Click here to download a .pdf version of the Support Center page for our previous Site Admin interface. When your website appears in Google’s search results page, the listing is composed of three parts: Site Title, Page Title, and Page Description (also called the meta description). These are where you should add the keywords you’d like to optimize your site for, as well as a brief description or call-to-action. Wait, you haven’t decided which keywords to use? Time to take a step back and do some keyword research. In this example, "Search" is the Page Title, "Jimdo Support Center" is the Site Title, and the paragraph below is the Page Description. 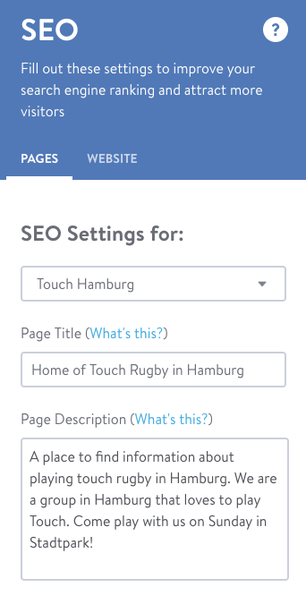 To edit your Site Title, open the Menu and navigate to SEO > Settings > SEO. When you click on the ‘Website’ tab, you’ll then see the option to enter your Site Title in the text field, and click Save. It’s a good idea to keep your Site Title pretty short: Google will display your Site Title and Page Title together and will truncate the combined text after ~55 characters (including spaces). Usually the name of your company makes a perfect Site Title. You can edit your Page Title and Page Description for each page on your site. To do so, open the Menu and navigate to SEO > Settings > SEO. On the Menu that pops out, you’ll see an option within the ‘Pages’ tab to edit the Page Title and Description for every page of your website. You can choose what page you’d like to edit the Title and Description for by simply selecting it on the drop-down menu. Keep your Page Title relatively short so it's not cut off by the ~55 character limit, and keep your Page Description under 160 characters. Ideally, your Page Description should provide more information about what someone can expect to find on that webpage, and encourage them to click on it. Note: Pro, Business and Platinum users can set a Page Title and Page Description for every page of their website. JimdoFree users can set these for their homepage only. A URL is the unique address of a given web page—it is displayed in the address bar of your browser and in search engine results. Best SEO practices suggest that it's a smart idea to keep the URL simple, but descriptive. Typically, web page URLs are auto-generated from the page name you enter in the Edit Navigation menu. With the Customized Page URL feature, you can overwrite the auto-generated URL and change it to a custom URL of your choice. Keep in mind that the old URL will not automatically forward to the new URL, so be careful when using this feature. This feature is available to JimdoPro and JimdoBusiness customers. Business and Platinum package owners have access to advanced SEO settings called robots meta tags. 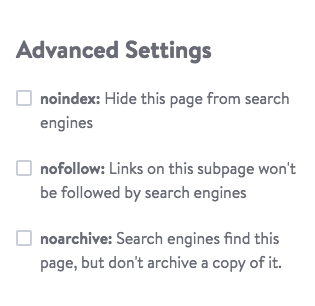 These robots meta tags—noindex, nofollow, and noarchive—allow you to control the way that search engines interact with the pages on your website. noindex: When noindex is activated for a page, that page will not show up in search results. For example, if you’re rebuilding your site and will have two pages with the same content, set one as noindex so that it won't show up in search results. noarchive: When noarchive is activated for a page, Google and other search engines will not archive that page (i.e. no cached versions of your site will be available). Use noarchive for a page that has outdated information on an older version (e.g. information about an obsolete product) so that the cached version cannot be accessed by your customers. nofollow: When nofollow is activated for a page, links that are on that page will not be followed by search engines. Use nofollow on pages where you can’t control all of the links that are posted (e.g. on pages with Guestbook Elements) so that those links aren't followed by search engines.